Digital labels are incredibly useful for boosting your brand identity. Perhaps one of the greatest benefits to digital labels is the counterfeit protection. Thanks to toner protection, raised images and UV toner. It can be near impossible to replicate a digital label that utilises all of these techniques. Thanks to our state-of-the-art printing technology, our printers can handle large orders with ease. This enables us to offer a swift and reliable turnaround. Digital printing is very cost effective, especially when compared to printing using plates. With digital printing, you don't need to set up a plate for every time. It is a swift, inexpensive way to print labels, even for short orders. When you order from FineCal, you can expect a swiftly produced, high quality and hard to counterfeit label. There's a reason we're one of the most popular label printing services in the country. We simply do not compromise on quality. 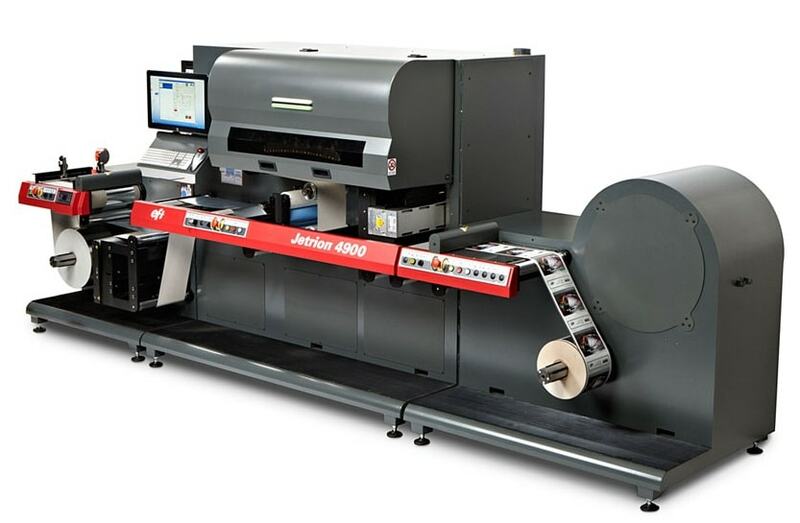 Our main printer (the EFI Jetrion 4900) enables us to transfer a print file onto a finished roll without any interruptions. We can create high quality labels that are totally unique, no need to follow any templates or designs, just send us a print file and we're good to go. We have over 40 years experience in providing high quality printing. We're one of the UK leading providers of printed labels and are ISO 9001 2008 accredited. Our prices are as low as possible, without sacrificing on quality. We work hard to ensure that our products are both high quality and fairly priced. If you're looking to print a short limited run of products. Thanks to our high quality equipment and wealth of experience, we can create a short and reasonably priced limited run of printed labels allow you to take advantage of seasonal trends. If you're still not convinced on the benefits of digital labels. Then not to worry, we offer a free sample service. If you would like to request free samples, we have a simple to use request form. In this form you can either specify what type of label you're interested in (for example cheese labels) or we could send you a selection of samples. We are an independent family owned business, enabling us to provide you with a level of service you'll be hard pressed to find elsewhere. At FineCal we strive to not simply meet expectations, but to exceed them. Our state-of-the-art label making services allow us to provide you with the high quality product you need to both attract and inform customers. Our label making services are one of the best on the market; don't just take our word for it, read some testimonials from some of our customers. Over the past years we have created numerous incredible labels for a wide variety of businesses. Our packaging has been featured on a rage of items, ranging from food & drink to chemicals. Thanks to our 40 years of experience we understand the best design techniques and know how to create great and unforgettable printed labels that can drive sales and increase brand awareness. If you're interested in more information or have any questions you'd like to ask before you place your free sample order, then you can call our professional and dedicated team on 01179 711 111. Our lines are open Monday to Friday, 8:30am to 4:30 pm. Alternatively, you could email us at labels@finecal.co.uk.